This week I have to dub the “week of the 3-D documentary”. 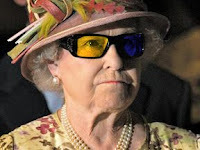 After watching Warner Herzog’s Cave of Forgotten Dreams in 3-D at the Toronto International Film Festival last Saturday, tonight Canada’s public broadcaster the CBC aired a one hour documentary on Queen Elisabeth II with partial segments in 3-D. This is the new millennium of 3DTV Canadian style. Our national broadcaster is not offering the documentary to the elite owners of the new fangled television sets, but in the true nature of public broadcasting is presenting the documentary’s dimensional assets in that age-old anaglyph format. The glasses (utilizing an amber and blue set of lens patented as ColorCode 3-D) are available to the public at Canada Post outlets for free. 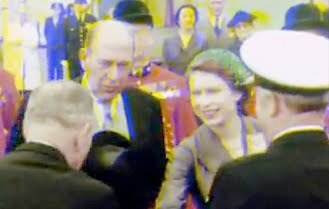 Queen Elisabeth in 3-D is not so much a documentary as an excuse to broadcast 3-D footage from Elisabeth’s coronation in 1953. 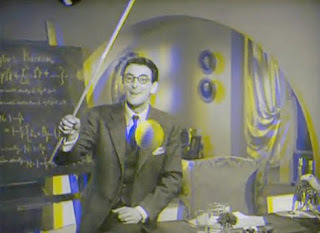 This 1-hour special fuses the archival footage and new 3-D footage of Queen Elisabeth’s recent visit to Canada with factoids about 3-D technologies then (the fifties) and now, all wrapped up in horrible narration delivered by award winning novelist and actor Ann-Marie MacDonald (though we can excuse her since she didn’t write the script). However, the 3-D worked very well particularly the recently discovered coronation footage and I’m a sucker for old 3-D footage. The usual misinformation about fifties 3-D films was tossed around and the Creature from the Black Lagoon was referred to as a blob of latex (you’re on thin ice CBC with that description) but it was nice to see some British short subject clips included. In this case A Solid Explanation that was a 3-D demonstration film produced for something like the 1951 Festival of Britain, though I haven’t checked that. The biggest disappointment with the special was discovering that much of this footage has been broadcast during Channel 4’s 3-D Week in Britain last year and repurposed for the CBC. The Paul Morrissey film Flesh For Frankenstein (1973) was also broadcast that week, a true depthsploitation film. Come on CBC lets follow-up with that! The documentary will be rebroadcast on CBC News Network September 22 & Saturday September 25 at 10 pm ET/PT, so head out to the post office and grab some glasses. My Herzog review is coming, with an additional 3 TIFF screenings on Sunday and a touch of the cold I’ve been a bit shy of time.